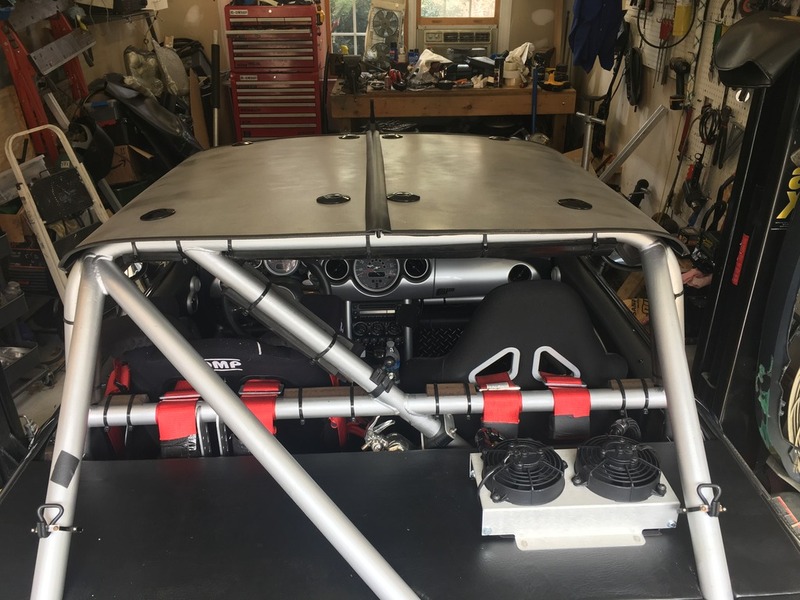 Last year, I fabricated a “bikini” style soft top for the GP Roadster. It served its purpose, keeping me and passengers mostly dry during wet trips. But right away, I started thinking about how nice it would be to have a removable hard top for such trips. 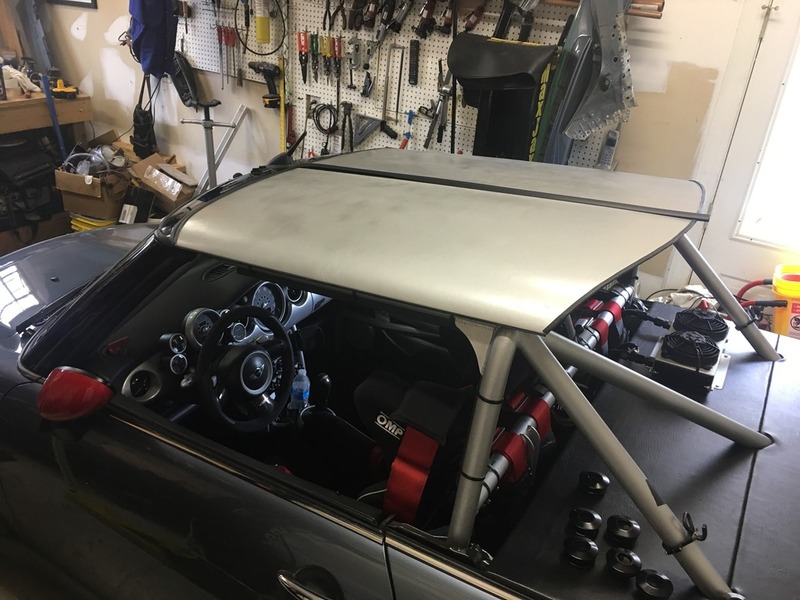 The best starting point for this would be an R50/R53 roof assembly. Sadly, I only thought of this a few months after sending the GP carcass to the shredder… it would have been the perfect roof donor. Oh well, water under the bridge. I started searching for another roof nearby, at a price I would pay. 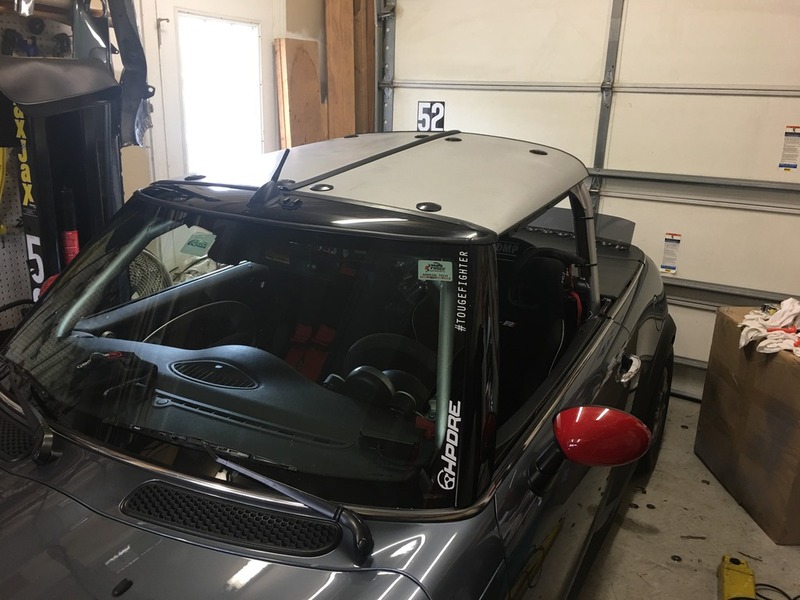 I finally found an R53 roof at a salvage yard about an hour away, for a couple hundred dollars. So I bought it. These have a ton of layers of steel welded into a “sandwich” with air gaps, to make a very stiff, strong structure. 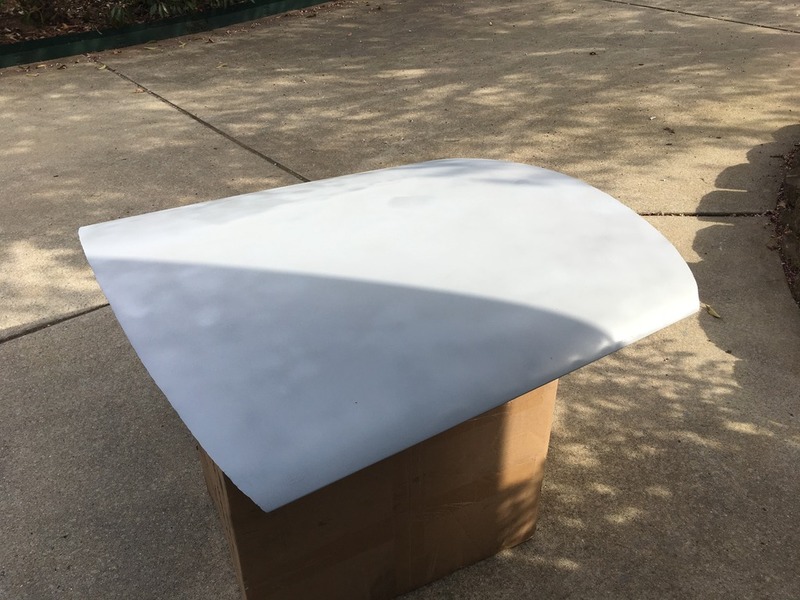 I cut the rear profile to match the curvature of the top of the new rear spoiler. Sand and prime the roof panel. Not going for perfection; it’s gonna get banged up anyway. Just want it “decent” for now. Measure, mark, and split the panel with the nibbler. Applied a few coats of silver wheel paint, which is a pretty close match to the Pure Silver. Painted the underside with satin black chassis & roll bar paint. Just going for “good enough” for right now… if it all works out, I’ll take it apart and refinish later. 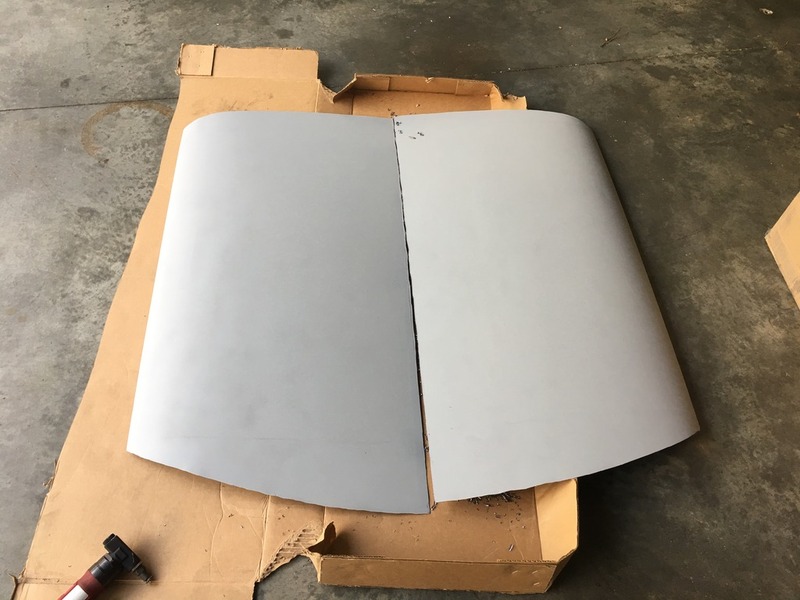 Added edge trim all around both panels. Then I found a source for Chinese knock-offs of the Quik-Latch. Yeah, I know. I’m not usually into such things… I buy the real deal whenever I can. But there’s no way I was going to buy $1200 worth of latches for my roof. $100 total, shipped from China, was more in the budget. These are pretty slick. 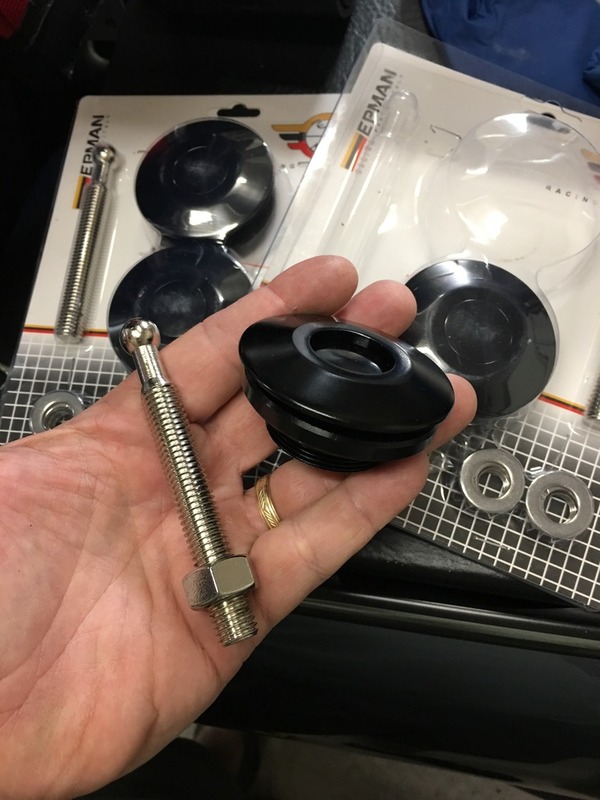 Billet aluminum latches have a ball bearing ring that snaps closed around a ball-top adjustable hood pin. Push the button on the top to release, it stays released until you press it back down on the ball. Spring tension in the latch should help dampen vibrations. At least that’s the theory. I measured and identified locations where I’d have enough clearance for the “stack height” of the assembly, and where the roof skin was flat enough for the latch. 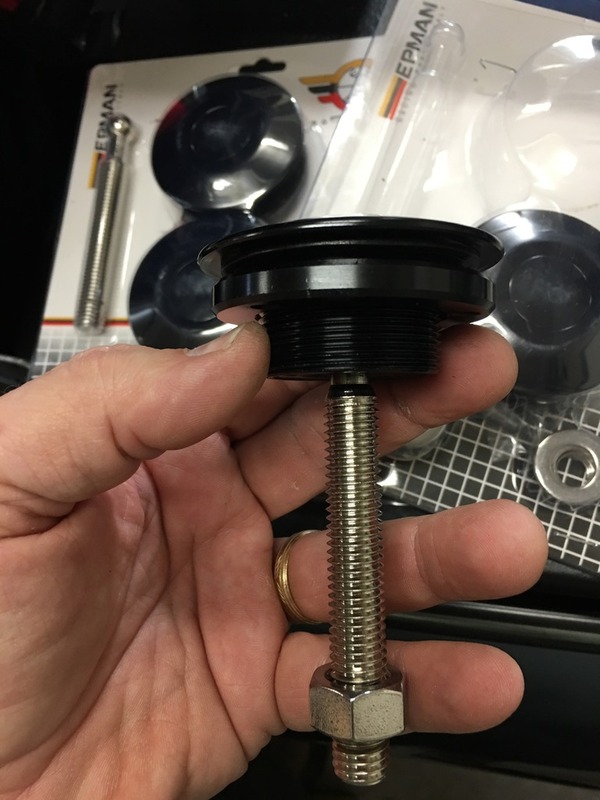 The adjustable pins are designed to mount through sheet metal with nuts and washers. 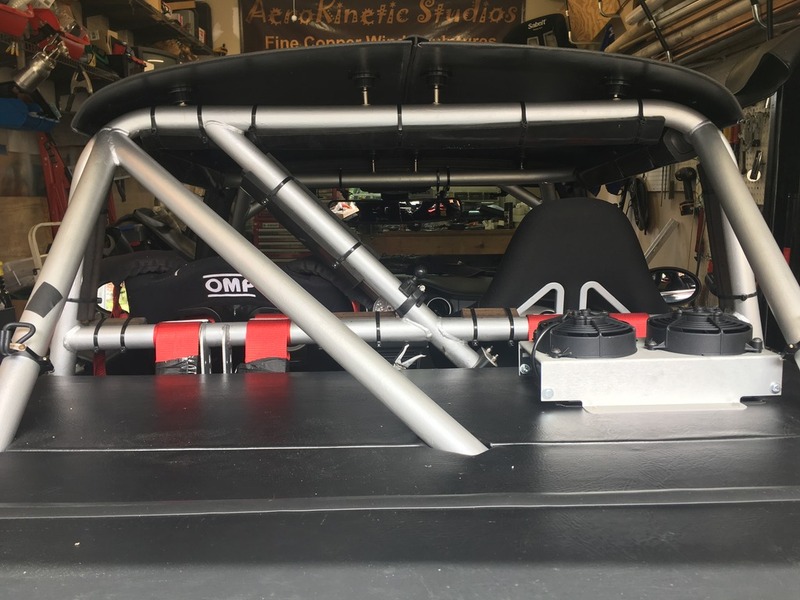 But that’s not appropriate for mounting on the roll cage. So I drilled the cage and installed 8 M12 outserts. 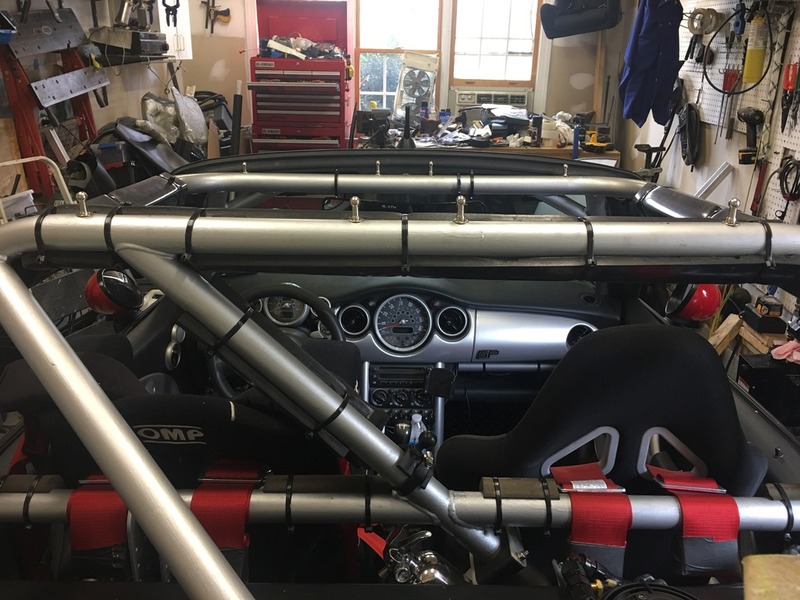 Yeah, I know… holes and roll cages aren’t a great combination. If it was a wheel-to-wheel race car, I’d be concerned about it. But it’s not… and I’m not. I avoided bends and junctions that will see highest stress in a catastrophic incident. Measured and cut down pins to an appropriate length to provide the necessary adjustment range in each location. 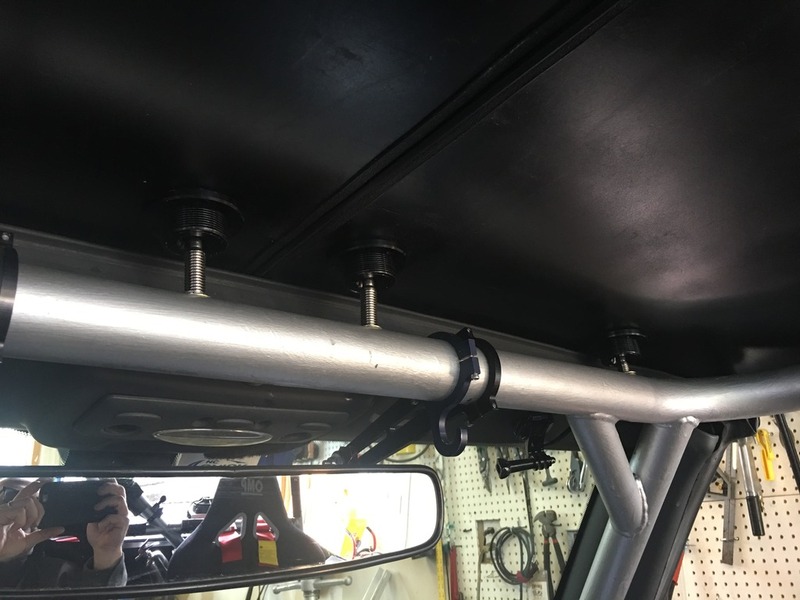 Fit the roof panels in place, adjusting the pins to hold it at the desired ending height. Lined everything up, including the center seal for the panels, and taped into position. Checked, double checked, triple checked, and then marked the center points for the latches on the bottom of the roof where the pins touched. 2″ hole saw to cut holes for the latches… install latches… and the moment of truth! I’m most excited about the tight fit against the factory convertible roof seal at the front. Should be leak-free! I’m actually a little surprised how well it came together. 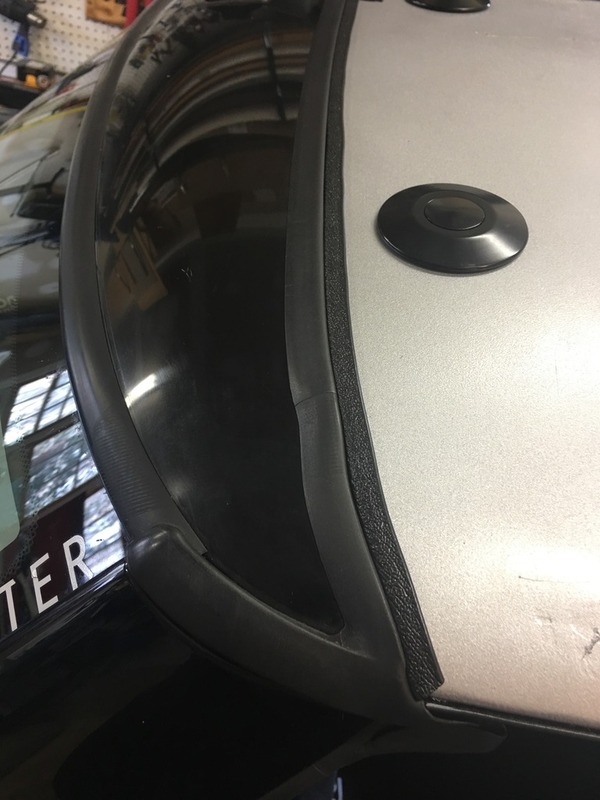 But the first real test… how secure it is when driving? I did a total of two hours of spirited driving, over smooth and rough roads, at speeds up to 90mph. Zero wind noise, zero whistling, zero rattling. It’s just on there, solid. Relatively quiet, calm, and civilized in the cockpit. With the windows up, the heat actually works and makes the car quite livable for four-season use. I can install and remove the roof in about a minute, maybe less. Stows in the boot; I need to work up a secure storage method so it’s protected and doesn’t shift around back there. That’s next. 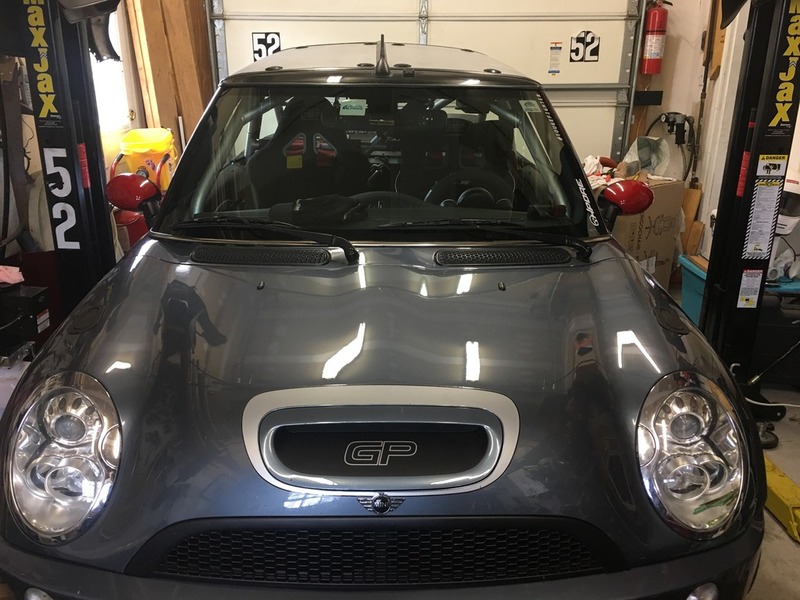 I’ll be able to test it in the rain this coming week, to see if I’ll need to make any adjustments, or add any window seals, or add any “wings” in the rear to prevent blow-back. But judging by the airflow in the car today, I don’t think it’s going to be a problem. Very calm inside with the windows up. I’ll refinish it to look nicer, once I get the storage solution done, so I can protect the finish. Stay tuned.